Bob Schieffer has spent 40 years reporting for CBS News. As a college student at Texas Christian University, Bob Schieffer never really struggled with priorities. In fact, he admits that schoolwork was really not a priority, instead focusing most of his attention on a reporting job he held at a local radio station. “In reality, college life for me ended the day I went to work,” Schieffer writes in his 2003 best-selling book This Just In: What I Couldn’t Tell You on TV. “My great regret is that I never gave college a chance and it took many years for me to realize what I had missed.” Schieffer will take another swing at college life next spring when he serves as the keynote presenter for RIT’s 125th commencement. He will deliver his address during Academic Convocation, which is scheduled for 3 p.m. Friday, May 21, in the Gordon Field House and Activities Center. A news reporter for more than 50 years, Schieffer recently celebrated his 40th anniversary at CBS News. He has served as moderator of Face the Nation, CBS News’ Sunday public affairs broadcast, since 1991, and he is also CBS News’ chief Washington correspondent, a post he has held since 1982. Throughout his career, he has been honored with virtually every award in broadcast journalism. “As a senior statesman among journalists in media today, Bob Schieffer brings valuable insight that will help shape the perspective of our graduates, particularly as they enter a new era in their lives filled with boundless possibilities,” says RIT President Bill Destler. “It will be a tremendous honor to welcome him on campus to take part in this time-honored celebration.” Schieffer has agreed to serve as RIT’s commencement speaker at the invitation of Timothy Busch, executive vice president and co-chief operating officer of Nexstar Broadcasting Group, which owns local CBS affiliate WROC-TV (Channel 8). Barry Culhane, executive assistant to President Destler, also played a key role in securing Schieffer’s visit. 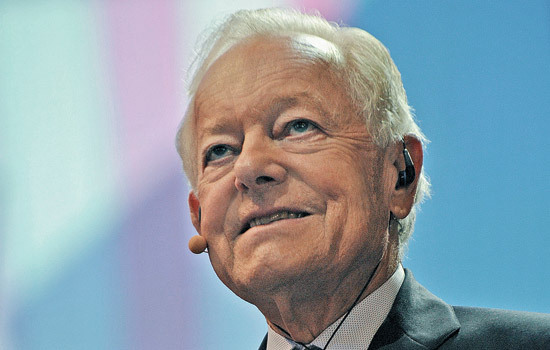 Schieffer joins a distinguished list of recent RIT commencement speakers that includes Ursula Burns, president and CEO of Xerox Corp.; President Bill Clinton; Dean Kamen, entrepreneur and inventor of the Segway personal transporter; and Sen. Daniel Inouye.